The National University of Singapore (NUS) researchers have developed MantaDroid, an aquatic robot that mimics the swimming locomotion of manta rays. The robotic manta ray swims at the speed of twice its body length per second and can work for up to 10 hours. It could potentially be used for underwater surveillance in future. Manta rays are believed to be one of nature’s most efficient and graceful swimmers. Unlike many other underwater species, manta rays have a propulsion mechanism that allows them to cruise through violent seas by flapping their pectoral fins smoothly. This unique feature has created great interests in understanding the science behind their mechanism and to include similar mechanisms in autonomous underwater vehicles (AUVs). 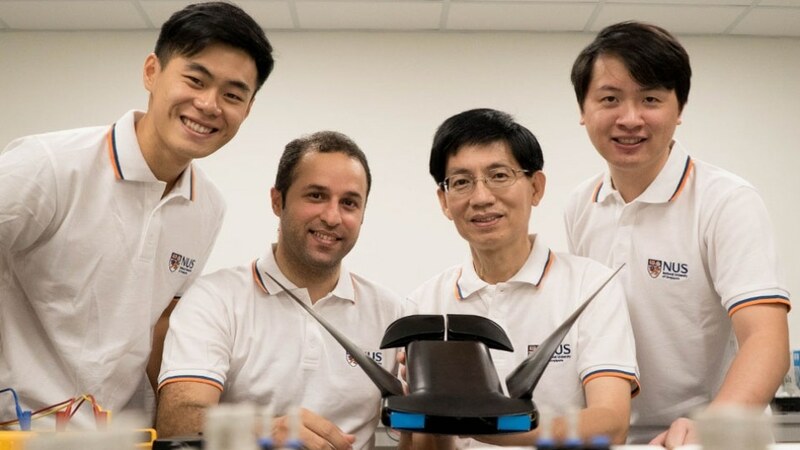 Enthused to develop a bio-inspired AUV, a research team headed by Associate Professor Yeo Khoon Seng and Associate Professor Chew Chee Meng from the NUS Faculty of Engineering’s Department of Mechanical Engineering developed MantaDroid, which looks like a juvenile manta ray. MantaDroid, measuring 63 cm in width, 35 cm in length, and weighing only 0.7 kg, can swim at a speed of 0.7 m per second, which is two times its body length, for up to 10 hours. MantaDroid was designed and enhanced over two years after a detailed study of fluid dynamics and several experiments, which comprised testing of 40 different fin designs. The fins that were finally installed on the robot are a pair of flexible pectoral fins made up of PVC sheets. When tested in the pool, these fins achieved better maneuverability and swimming capability. Unlike other flapping-based underwater robots that replicate manta ray’s flapping kinematics by using multiple motors to achieve active actuations throughout the fins, MantaDroid is powered by only one electric motor on each fin. We then let the passive flexibility of the fins interact naturally with the fluid dynamics of the water to propel the subsequent motions. MantaDroid can be a promising alternative to conventional propeller-based thrusters employed in traditional AUVs, and could potentially work for a longer range. Like the real manta ray, MantaDroid also has a wide and flat body that can accommodate a variety of sensors and be utilized for various purposes, such as performing search operations, measuring hydrographic data and studying marine biodiversity. As a next step, the NUS team will test MantaDroid in sea environment in order to study its ability to withstand underwater current and its swimming capability at different depths. The team is also working to integrate more modes of movement in the fin mechanism of the robot.